Thank you for UltraBook giveaway. I could use the ultrabook and put it to good use due to it being so light and easy to handle compared to older laptops along with the added speed. I really need a new Intel-powered Ultrabook because I’m often away from home and have no way of checking my emails or doing my work without having a laptop. Even at home, with my kids having to use the computer for their school work, seems like I have to wait until the evening before I can use our computer. Honestly, mine has just stopped working! If it wasnt for my mobile i coulndt even enter this! Thanks for the giveaway! We need an Ultranotebook by Lenovo because, just when it was my turn to get a laptop, our other two (my hubby’s and my daughter’s) have decided to fail. Thanks for a change to win! I could really use a new laptop because I gave my son mine because the one I bought him 2 years ago died and he needs one for college. With college expenses and helping to pay for my upcoming daughter’s wedding, a new laptop is not in the budget for quite some time, especially with being a single Mom. I’ve never had a notebook, don’t know anything about Lenovas or their functionality vs. PCs or other laptops. Don’t have the money and am illiterate when it comes to new products. I don’t even have a smart phone. I’d love to be able to surf the web or check my e-mails from work while I sit in the doctor’s office waiting for my parents to finish their appointments, which seem to take forever. I’d love a Lenvovo to take on the road when camping to keep up with email and the news and such. Hope I’m a lucky winner! It would be great to organize all my loose recipes among many other uses! Thanks for the opportunity! I need a new Intel-powered Ultrabook because it is so light. My current laptop, which I have to lug to and from work, is about five pounds when you include the power supply. Five pounds is a lot when you carry other things as well. A lighter laptop would be a big help. Would so Love to replace my 10+ yr old desktop! we adopted a 14 year old last year and she could certainly use it for school. She has managed to learn English and keep up with her Chinese. This would make a wonderful gift for her to help with her studies. I need a new Intel-powered Ultrabook to take minutes for the nonprofit Boards I serve on. I currently use an old slow netbook with a noisy fan. Right now I have a big heavy 17” laptop and would use this one much more on the go. Ahhhhh, I so need one for school, this would be PERFECT! Pretty please! My desktop is so old and I waste alot of time just waiting to get on line. Wold love to replace it with a laptop. I have never owned a laptop but would love to have one for the portability. Thanks for contest—my laptop is 7 years old—it needs to be retired! notebook to check my upcomming work events, schedules, and documentation. I’m a professional writer and my older Dell laptop finally passed away several months ago. I depend upon computers to run my freelance business and, while I do have a desktop, a laptop lets me to work outside my office with a degree of flexibility that is otherwise lacking. So a new Lenovo would be extremely helpful in conducting my writing and coaching business. I need this because I need power, power, power!! I work at home - this would be great! Could use a new laptop for the new year! I’ve thrown my back out so many times lugging my ancient laptop around… this would be a dream to have a lightweight, functioning computer for all my business trips! My laptop is 6 or 7 years old. The battery doesn’t hold a charge, so I have to keep it plugged in. I’m constantly getting messages about how I have no space left to do anything, even though my computer has few extra programs or files on it. I use my laptop both for work and personal use, and my son uses my laptop as well. I would love to have something new that will work well for many years in the future! I only have a netbook, which is limited to only doing certain things. I need a new laptop so bad, yeah, everybody’s stars off this way. I have a 2006 Toshiba that arbitrarily clicks open pages, skips up to a different line when I am typing and even though I have removed every unnecessary thing from the computer, is slower than molasses! I need a new laptop so I can give it to my boyfriend because his Mac is starting to die. Because of a disability, I spend a lot of time in bed and use a laptop. Mine is several years old now and I’d love to win a new one. I’ve never had a Lenovo, either, and I’d love to try it out. Thanks for the giveaway! My screen is shot. The bottom half is dead. Makes it very hard to use the computer. 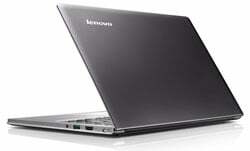 I need the 13” Lenovo® IdeaPad® U300 Intel-powered Ultrabook to power my life! Old one is getting ready to bite the dust. I could definitely use a new, powerful ultrabook since my 8.5 year old laptop is getting too many gray hairs. I need a new Intel-powered Ultrabook because my hp laptop DIED! The hard disk drive works, but something else (apparently serious) doesn’t - so I need a computer to which I can transfer all my work from the poor, orphan HP disk drive. Thanks for listening. Mine is so slow, you would think it was as old as I am!! My laptop is dying a slow and painful death. I fiddle and tweak but there is just no more space. I’ve already added an external drive for more space but it heaves and it ho’s when I try to access it. I want to participate in an online fitness program. I am disabled and it’s very difficult to get out every day to a program. A new laptop is just the ticket to better health. I really need a laptop. I don’t have one and many times in meetings I missed everything until I’m back in my home/office this would be a blessing. I am starting my own business and I need the latest technology to help me manage it. I would love to win the Ultrabook! Have been trying to save up for a laptop to improve customer presentations in my new job; which should help me make the extra money I need to buy things, such as a laptop, to make better presentations…and therefore make a little extra money. I’d love a portable…I only have a desktop. My wife and I share the desktop in the house and frequently have to use it at the same time. It would be great to give her the shiny new Ultrabook that she could take and use anywhere! I need a laptop for my daughter, she needs one for college and this looks like it would be a great one for her. I need a laptop, please! Special Needs Organization..for papers that is. I could use this to organize my son’s important IEP school papers neat and organized. Right now they are all in a pile. I would be so nice to keep them all in one place nice and tidy. :D thanks for the chance. I need a larger screen while accessing the interent while I am away from the office and the Lenovo would be perfect. I work from home and need a workhorse!! My computer is older and slow, so I need one that can keep up with me!